The Dolphin Royal Swim experience in Punta Cana is a one-of-a-kind dolphin encounter excursion that allows you to swim and play with dolphins. This experience includes a dolphin foot push, dorsal tow, kiss, hug, caress and handshake. The Dolphin Royal Swim is an intimate small-group experience, allowing for plenty of time to interact with these fascinating sea mammals. 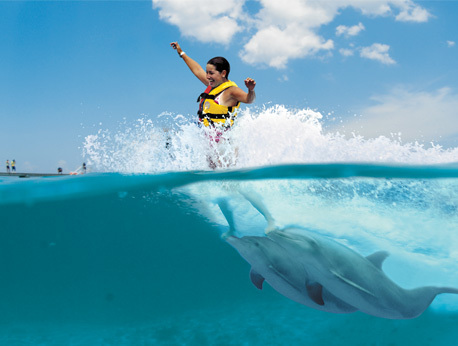 Dolphin lovers, have you ever dreamed of swimming along with a playful dolphin? Now is your chance to swim with some of nature’s most beloved creatures. Try our hour-long Dolphin Royal Swim to interact with these playful mammals in their natural surroundings. Get up close and personal with the dolphins during the Dolphin Royal Swim in Punta Cana. You can snuggle, swim, play, or watch the dolphins do aerial acrobatics. Our dolphins will give you a handshake, greet you with a kiss, or even give you a hug. Our Royal Dolphin Swim is different than other dolphin excursions because it offers several unique features that others do not. You will have the opportunity to experience plenty of adventure and excitement on our tour. Enjoy a special dolphin “foot push”. This is where two dolphins join together to lift you out of the water with their snouts. Our experience also includes a “dorsal tow”. During a dorsal tow, two dolphins pull you across the clear blue water while you hold onto their dorsal fins for a ride that you will never forget. Groups are kept small, at a maximum of 10 people, to allow each guest to have a personalized experience with the dolphins. Our trainers are funny, knowledgeable, and entertaining. They will teach you all about how these intelligent sea mammals. You will learn all about a dolphin’s behavior, environment, and communication skills. Immerse yourself in a dolphin adventure like no other with the Royal Dolphin Swim. Enjoy Punta Cana's gorgeous Caribbean waters and get plenty of opportunities for great photos to help you remember your adventure. On your vacation in Punta Cana, why not make a friend with a majestic sea mammal and enjoy an experience that you will never forget?